Photo above: Senators are sworn in. 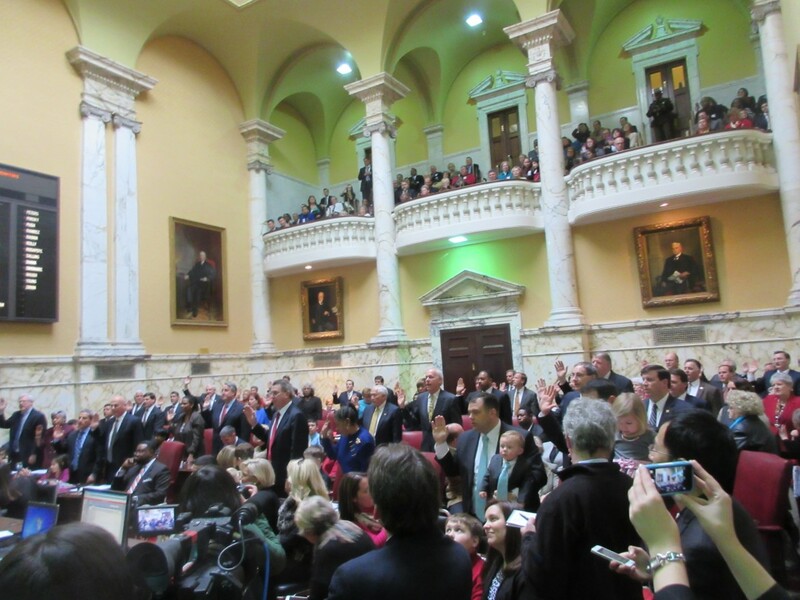 There was good cheer all around at the State House Wednesday as the 188 members of the Maryland General Assembly were sworn in for a new four-year term. It was the largest class of newbie legislators in 20 years, 58 new members of the House of Delegates, 11 new senators. Republican Gov.-elect Larry Hogan emphasized the need to work together in speeches to the Democrat-dominated House and Senate. That was dramatized by his appearance and greeting of legislators with Democratic Lt. Gov. Anthony Brown, the man he beat in the Nov. 4 election. Here are some photos of the day by MarylandReporter.com’s Rebecca Lessner. More coverage in other media is found in today’s daily State Roundup. Lt. Gov. Anthony Brown and Gov.-elect Larry Hogan talk to reporters before the legislature is sworn in. Hogan is inaugurated next Wednesday, Jan. 21. Hogan addresses the House of Delegates as Speaker Michael Busch looks on. Hogan and Senate President Mike Miller on the Senate Rostrum. Miller talked of his 50-year relationship with the Hogan family and said their mutual love of Maryland would help them work together. At the first demonstration of the 90-day session, the Maryland Climate Coalition called for action in 2015 to double the state’s use of clean electricity like wind and solar.